Gonna start trying to do this every Friday. The weekly weigh in. I started this journey Jan 1st. So technically this is week 7. Last week was a little rough on the diet. It’s very hard to lose weight and remember portion control when you’re surrounded by food that people are bringing in due to a death in your family. I don’t know if I’ve ever eaten that much potato salad in one week. But it sure was good. Thankfully though, I got back on track this week and have continued the downward trend. 1. I only lose weight when I exercise. I don't lose nothing if I just eat well. 2. I don’t enjoy exercising. I know some people describe the feeling after exercising as a “high”. I don’t feel high. I feel "plumb tuckered out" and then "mighty sore" in the days that follow. 3. My clothes are getting baggy. That gives me a good feeling. 5. I miss ice cream. 6. My current playlist for exercising is the new album by Cake. I enjoy Cake, the band and the dessert. 6. How healthy I eat is all determined by how well I plan ahead. We were out of breakfast bars, yogurt, and bananas this morning. So my breakfast was a Little Debbie oatmeal cream pie. Oops. 7. I’m going to have to buy better shoes if I really want to keep training for a 5K. To go = 68.4 lbs. My blog has been silent for a few weeks. There's a reason. My dad, Charles Lee Stinson Jr., went into the hospital on Sunday, January 30th. He passed away on Monday, February 7th. We celebrated his life with a worshipful funeral service and laid his body to rest on Friday, February 11th. 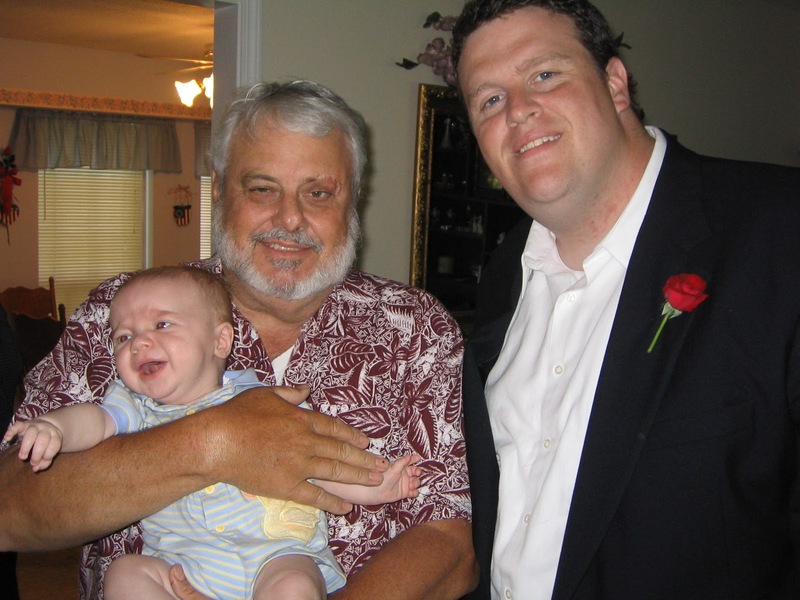 Ethan, Dad, and me on Father's Day 2004. 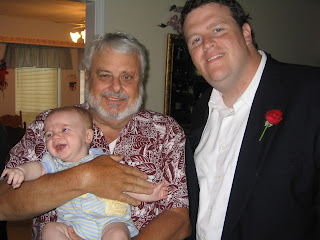 Three generations of Stinson men. While on this earth, he enjoyed fishing, flipping cars for a profit, and spending time with family. How to honor my father and mother. How to be a great father. How to be a loving husband. How to be a committed follower of Jesus Christ. And, how to have a good time and enjoy life. Unfortunately, I have stumbled in all of these areas at different times in my life. Thankfully, he also taught me about forgivness and grace and mercy. I thank God that I was raised by him and pray that I can be half the man he was. I will miss him immensely until I see him again one day. Heavenly Father, thank you for letting him be my earthly father. And Lord, please tell him I said "Hi" and "Don't worry.